David, it's great that Amsterdam is not resting on its laurels, and is seeing, as you say, such explosive growth, with more people cycling than in any city outside of the Netherlands. However there is some slight confusion about the figures - in all cases they add up to (around) 100%, so has walking been excluded? Mark, You're right. 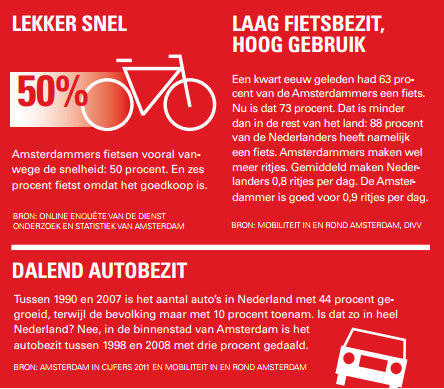 The Fietsersbond have fallen into the trap of reproducing figures which show the city in a better light than is the reality, and I've followed them right into it. There is no accounting at all for walking in these figures. I guess that is the reason why the cycle figures seem a little higher than you might expect. 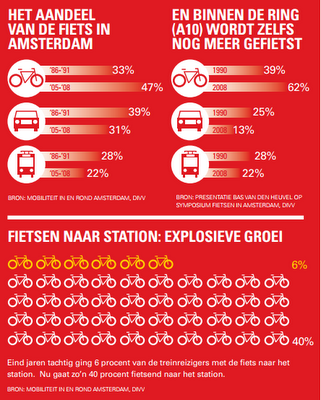 Figures that I recall from the early 1990s for cycling in AMS were about 27%, not 33%. Assuming that walking takes about an equal share out of all three modes, that would put the walking modal share at about 20%. If we assume that the number of journeys walked has not changed, then we can scale back the figure for today by about the same amount, to about 38% ( = 47*27/33 ). This is about the figure I've seen elsewhere before. Driving and public transport would then have about 25% and 18%, making a total of ~= 100%. The bike still beats the car, and walking and cycling together account for over twice as many journeys as cars. The figures come from a document which is publicly available, page 60. Move on to page 64 and 65 and you start to see some mention of pedestrians, but not in a useful way to work out the exact modal shares. I have to say that getting good stats is always a difficulty. I covered this same document before, but that time I left out the modal shares as I didn't quite believe them. Interesting article, but my Dutch is not as good as it should be. Is there a translation into English or French? Ahh... modal share, everyone's favourite barometer. But it is quite elusive. Should we mainly consider non-private car mode share, because everything else is better? If some of the cyclists are actually walking, is it a problem? What about people who ride bikes for captive rather than active reasons? Should the question also be "is everyone using the mode that they would prefer to use?". No, perhaps, in regards to cars, but yes in regards to cycling, right? This would be because the car is still too convenient and the bike still considered too dangerous. And there is bike + train (and in this blog entry the huge amount of bike train trips are noted) which replaces the car, the subject of the "primary means" question which ends up in our little mode share articles after some processing. I am very happy for Amsterdam because I believe that in reality mobility is getting softer and the majority of people are doing what they want to do. More about modal share starting here. The terrible parking situation in Amsterdam (paid parking is very expensive, while getting a parking permit can take up to 4 years) might play a role too, combined with a strict policy of clamping illegally parked cars.